ComForNet is a free, Internet-based, community-forest network—an interactive forum for sharing the hard-won skills and experience of community forest owners and managers throughout the world. From time to time, we will bring you news of a success story (or a noteworthy failure!) from the world of community forest enterprise. ComForNet's focus is clear: To exchange practical, innovative information that small community producers can use to achieve the highest possible return for their products in the marketplace. Our stories are written by or about real people in real communities who are engaged in a real effort to build a sustainable livelihood out of renewable forest resources. We invite you to read and respond to the articles you find in ComForNet with comments and questions or—best of all—stories of your own, which can be shared with other enterprising spirits in the world of community forestry. We hope you find our new network as exciting as we do—your participation in ComForNet is what will make it a success. NOTA: Copias traducidas de estos artículos se pueden acceder en la página ComForNet de la versión en "Español" de este mismo sitio. The chainsaw is often thought to have revolutionized lumber production during the 1980s and '90s, but in many respects it simply led to more of the same inefficiencies and overharvesting. In the absence of any local tradition or training in machinery operation or maintenance, the free-hand cutting practices that evolved over decades of producing hand-hewn lumber has only exacerbated the quality-control problems faced by local producers. The excessive wood waste that results from wandering, free-hand chainsaw cuts translates into a material loss of as much as thirty-five percent, which comes directly out of producers' pockets. By using a chainsaw guide and specially modified saw teeth, target dimensions can be achieved with only a nominal planing allowance and the smoother boards can be cleaned up with many fewer passes through the planer. This adds up to less labor, less electricity, fewer sharpenings and reduced wear and tear on both equipment and workers. On a larger scale, the sum of these quality-control measures-getting more boards out of each log, producing more furniture and less sawdust-is making a meaningful contribution to sustainable development in the Selva Maya. Read on...! When it comes to moving small-diameter trees and low volumes of timber, industrial skidders can be disproportionately large and expensive to operate. And the large skidroads they require cause excessive damage to the forest. Entrepreneurial foresters in Quintana Roo, México, have discovered that they can move sawlogs more efficiently-and with a lot less residual forest damage-from the stump to the landing, using recreational, four-wheel, all-terrain vehicles (ATVs), in combination with a homemade trailer or logging arch. Read on...! Throughout most of its recorded history, the Zona Maya region of southeastern México has enjoyed an abundance of bigleaf mahogany (Swietenia macrophylla). Over the centuries, these forests have been exploited in different ways by different groups. Until recently, forests in the area were effectively "mined" by large parastatal enterprises and a handful of private contractors, who were granted vast timber concessions by the government. 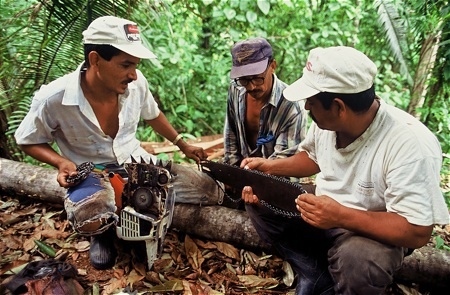 The Organización de Ejidos Productores Forestales de la Zona Maya (OEPFZM) was created in 1986 to support its member ejidos [local communities] in the administration and training needed to achieve sustainable forest management. OEPFZM launched a pilot program a few months ago in one of its smaller ejidos to assess the viability of an alternate method of low-tech timber processing, employing portable chainsaw "micromills" to supply lumber for a community carpentry shop. Other efforts to improve efficiency will include the use of special sharpening equipment and saw chain. Every step the ejidos take to improve their sawing, cant extraction, resawing and value-added processing will optimize the costs of production and help redefine the best practices for forest communities in Quintana Roo. Read on...!